Each of the cylindrical tankers has the same explosive force as two million sticks of dynamite, says Wheatfield resident John Cunningham. “If one of these goes off the rails, you evacuate everybody that isn’t dead, and you let it burn for three to four days. 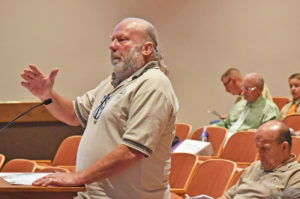 There isn’t enough foam in Western New York to put out one car,” he said during Monday’s Town of Wheatfield board meeting. 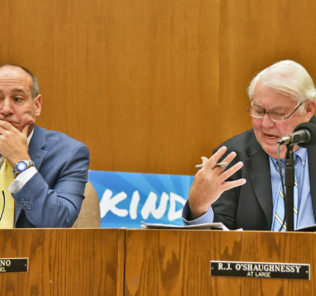 With a possible blast radius of one mile, Cunningham said, it’s a deadly threat he’s bringing to the attention of the public and their elected officials. 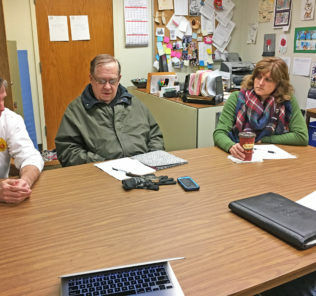 “I may have seen my first bomb train the other day,” said Wheatfield Town Supervisor Robert Cliffe during the meeting. 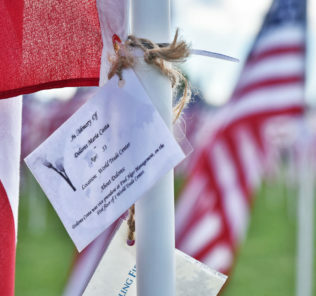 “I was over at Gratwick Park for the Healing Field and I stopped by and saw a train coming through, and it might have had two or three that were unmarked cars,” he said. Cunningham said cars carrying this highly explosive Bakken crude oil from the fracking operations in North Dakota are designated DOT 111, which can have a minimum thickness of less than a half an inch. 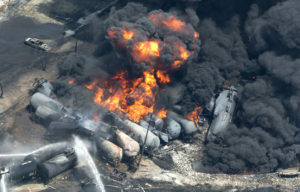 2013 Oil train derailment accident in Lac-Mégantic, Quebec. 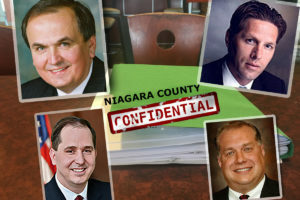 Cunningham told the town board that railroad lines through Western New York were being rebuilt to accommodate the extra-heavy loads. Cunningham said the oil shifts around curves, putting pressure on the outside wheels and causing them to derail. 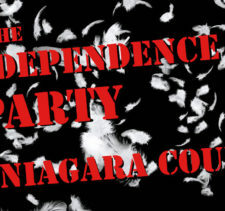 Cunningham also said there’s a national security aspect to this deadly scenario. 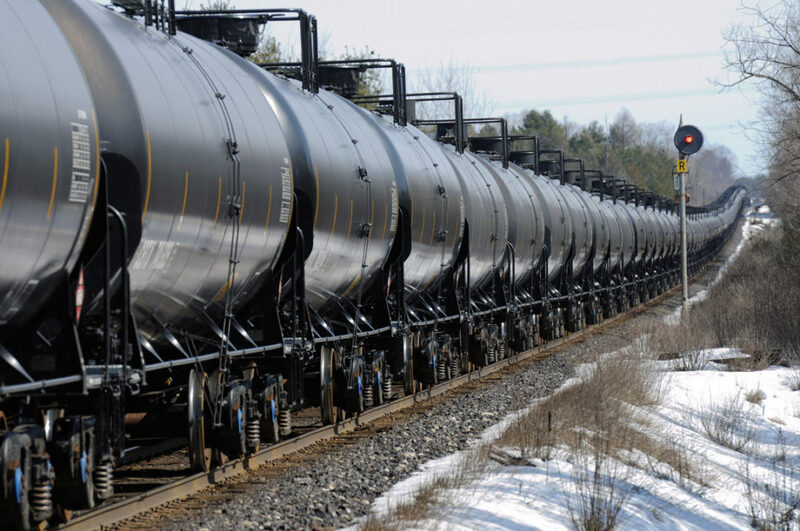 Sabotage could see the purposeful derailment of such a “bomb train” to devastating consequences in any of the many heavily populated areas along the Bakken oil’s winding route to Nova Scotia, where it joins the international market, he said. 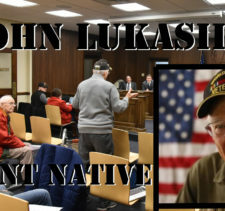 Two days later, on Wednesday, Cunningham attended the Erie County Local Emergency Planning Committee Public Information Forum in Cheektowaga, right next to the rail lines along Broadway that are bringing Bakken crude oil to this region. John Cunningham speaks to the Wheatfield town board about the “bomb train” threat coming to Wheatfield, Niagara County and Western New York. 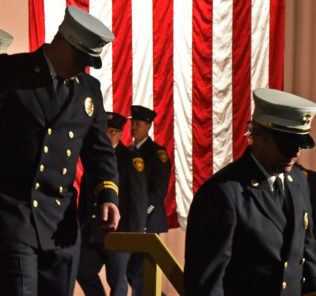 He also mentioned that industrial foam used in rail accidents are to protect other rail cars rather than put out the fire. 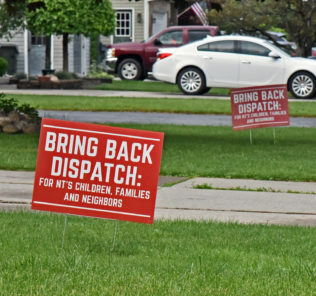 Neaverth said Erie County’s Emergency Services isn’t focusing on one specific “product” or disaster scenario, echoing a similar statement from Niagara County’s Director of Emergency Services Jonathan Schultz. 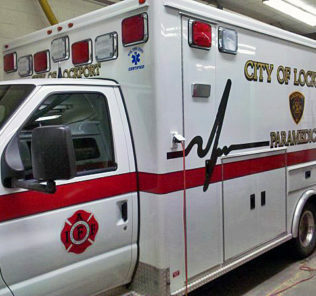 Lockport drops paramedic requirement; advanced life support restored to fire dept.